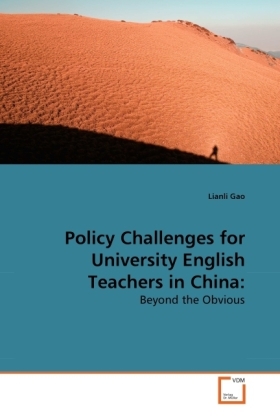 This book examines changes in tertiary English teaching (TET) in China and the perceptions of university English teachers, administrators and policy-makers to these changes, taking into account the complex context of globalisation of English and the historical, cultural, economic and political issues. It focuses on the tension between policy and reality in the areas of curriculum, pedagogy and assessment in TET by discussing how university English teachers are meeting the challenges of the changing expectations of their profession. A sociocultural perspective of Bourdieu and Bernstein is adopted and legitimation device' has been used to diagnose and analyse participants' orientation to change, the degree of autonomy conferred by the changes and the specialist knowledge needed to respond to the changes. It was found that power over university English language education remains centralised despite the apparent policy mandate to devolve autonomy in curriculum, pedagogy, and assessment to the universities and university English language instructors who do not have the necessary background and experience in language education to assume autonomy or implement reform.